THIS HISTORICAL SITE IS PRESERVED FOR POSTERITY BY THE STATE DEPARTMENT OF HIGHWAYS & PUBLIC TRANSPORTATION. 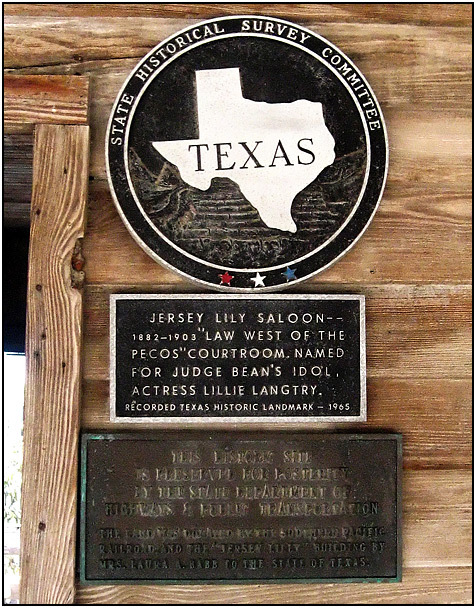 THE LAND WAS DONATED BY THE SOUTHERN PACIFIC RAILROAD AND THE JERSEY LILLY BUILDING BY MRS. LAURA A. BABB TO THE STATE OF TEXAS. I havn't figure out who Laura Babb is.